Influenza is highly contagious, harassing viral disease . The health risk of influenza is small - the disease is badly harmed by preventing us from concentrating on work and communication. It can be said that with the flu 20th century medicine does not know the advice. It is unable to limit the incidence of influenza epidemics or treat individual cases of influenza. However, the prevention and treatment of influenza can help to know and adhere to certain principles that we would like to justify here. We do not intend to replace encyclopedic sources of information, just to say some facts as they usually do not say. In folk verbs, flu and cold are sometimes used synonymously. I remember, as a child, I was not sure if flu and colds are two different diseases or not. They are not. Influenza is a viral disease , whereas the cold does not exist as a separate disease. " Cold " usually means flu, but also angina or any other inflammation . It's amazing how many people give up superstitions about the causal relationship of cold with inflammation, whether of the airways , joints , kidneys, ears or other organs. Strong hypothermia (and any excessive stress) does not benefit immunity, and weakened individuals can severely damage, but they do not directly lead to infection. Influenza and inflammation are not hindered by excessive dressing, heavy caps, or fur belts around the kidneys. The superstition of colds, in my opinion, has come from folk observation that influenza and viruses occur mainly in the autumn and winter, especially after long trips in cold weather. Folk wisdom was unaware of the existence of bacteria and viruses and the disinfecting effect of solar ultraviolet radiation, which is lacking in autumn and winter. It has not been related to the fact that long journeys in cold weather mostly end at fairs with stops in non-hygienic inns serving as outbreaks of internal infections. She was satisfied with the pragmatic and not the false conclusion that if we do not expose the cold to the wagons, the probability of the non- infectious disease will be reduced. And so the popular wisdom of "coldness" is haunted by our common consciousness today. The flu epidemic does not spread in the summer, because the disinfecting effect of sunlight is very strong. For several minutes of direct light, it reliably kills virtually 100% of active bacteria and viruses. However, after the onset of dry weather, we get the flu almost everybody. The influenza virus is very variable - every year we have viruses in the new coat. Therefore, unlike the pox pox, we are unable to create lasting resistance, so it is also not possible to vaccinate against the flu effectively. But that does not mean we have to approach the flu fatally. Tajvans with mask against flu. The only reliable way to treat influenza is to not get rid of it. Shorten your stay in busy places, drive less in public transport, do not stay in the crowd. Once you get the flu, stay at home so you do not bother colleagues at work. 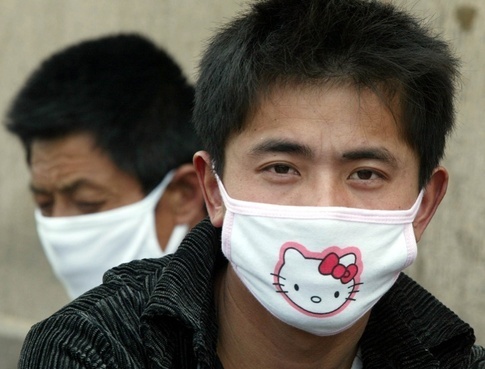 When you can not stay at home, the Japanese can protect the fellow citizens from the disease by wearing a surgical mask (picture). If you behave like this little Czech, then instead of the work or concert of your favorite band, visit recruiting meetings of pyramid schemes or public events for you unsympathetic parties and religious associations. In the prevention of influenza it is important to have a healthy immunity . Not nearly every viral particle that we catch on the mucous membrane of the nasopharynx will cause the flu. Your immune system will eliminate most of the captured viruses. The virus first has to reach the cells through a layer of mucus covering the healthy mucosa. The nasal mucus contains a large number of IgA-like antibodies and other immune molecules that are typically wrapped and disposed of by the viruses captured. Empirically, it has been found that some herbs and mucosal immunity adaptogens improve, although it is mostly unclear how. Clinical studies on influenza infection immunity are basically not available but at least in vitro the immunomodulatory effect of many medicinal plants has been demonstrated. The mucosal immunity generally also helps to strengthen and improve physical fitness. Influenza is a disease that can not be treated by common means - it is virtually impossible to stop the first signs of influenza. But the extent of mucosal and skin damage caused by influenza can be alleviated. The course of influenza is the balance between epithelial cell destruction by virus, secondary tissue damage by immune response and protective and regenerative processes. Influenza treatment therefore focuses on improving regeneration processes where herbs help but also antioxidant vitamins C and E. Influenza as well as smoking increase the consumption of vitamin C, which plays a direct role in the synthesis of collagen in the healing tissue. To a lesser extent, it is also possible to protect cells from damage by exaggerated immune response in the nasopharynx mucosa by cytoprotective herbs. Let's add antibiotics do not help in treating flu, because the infectious influenza agent is a virus but flu can sometimes be difficult to distinguish from a bacterial infection, and mixed bacterial and viral infections occur. In the use of antibiotics , therefore, we follow the advice of a doctor who will make sure that he is not prescribing to patients with a viral infection. Today's menu differs greatly from our ancestors' diet. We once ate many more types of herbs, many of which can be called adaptogens, and many have antiviral and regenerative effects. As I have already written, antiviral effects are only appropriate for the prevention of influenza. Once you get the flu, the antiviral herbs with the course of the disease will help little. However, vitamins and herbs with a protective and regenerative effect are suitable. Commonly available plants with antiviral effects include ginger, garlic, blueberry leaf, heart, oregano, rosemary, coriander, fennel, purée , hyssop, shishak and others. The regenerative effect of foods and fruits contains vitamins, especially vitamin C. They also help plant flavonoids and other antioxidants contained in large quantities such as small berries (blueberries, blackberries, blackcurrants). Antibodies to cellular damage by the immune response act by some adaptogens, the model ginseng is the right model. Ginseng right by tradition and many scientific sources improves immunity. Directly related to flu was mainly studied by the Koreans ( Yoo2012peg , Xu2012ikr , Lee2014iar , Kim2016rgv , Scaglione1990iet and others). Clinical studies concern most of the specific ginseng flu preparations. An example may be the Canadian ginseng polysaccharide preparation ColdFX ( Vohra2008stn ). Studies related to ginseng Ginsana ( Scaglione1996ess) has been monitoring for 12 weeks its influence on the incidence of influenza in people who have undergone polyvalent influenza vaccination. While flu vaccine in the control group of influenza vaccines occurred in 37% of cases (42 out of 113), in the ginseng extract group, flu symptoms or colds occurred in only 13% of cases (15 out of 114). In addition, the ginseng extract increased 59% of influenza antibody production and almost doubled the activity of NK lymphocytes . The preventive and curative effect of ginseng is explained by the action of some panaxosides and ginseng polysaccharides. For example, ginsenosides Rb 1 , R e , 20 (S) Rh 1 and 20 (R) Rh 1 increase lymphocyte antiviral activity ( Cho2002gfp ), while ginseng polysaccharides stimulate macrophages . In addition, the ginseng protects the infected tissue by the action of ginsenosides Rb 1 , Rb 2 , Rg 1 ( Cho2001vie , Cho2002gfp ). The overall efficacy of ginseng is givenimmunostimulatory and protective (immunosuppressive) effects . All of these herbs have a greater or lesser antiviral effect. Zimolez and golden oval are however slightly poisonous (not adapted) and should not be taken at a dose greater than about 2g per day. Two other plants from the mixture are slightly poisonous: juniper and edible meal. Forsythia suspensa called golden rain known to everyone, although toxic, is one of 50 essential herbs TCM . Zimolez is commonly planted in cities and in the wild. Not all kinds of honeysuckle are about as good as I have personal experience with honeysuckle ( Lonicera xylosteum ), tartar honeysuckle ( Lonicera tatarica ) and honeysuckle ( Lonicera periclymenum ). You can also use honeysuckle ( Lonicera caprifolium ) and Japanese honeysuckle (Lonicera japonica ), of which the latter is official in the Czech Republic. From the honeysuckle, flowers or leaves can be used, after ripening even berries, but they are bitter. Beware of overdose. Dr.Duke recommends that this herbal mixture be placed in a larger container and first after 1 hour of leaching with a large cup of cold water. This first leaching is used to extract those compounds that are better leached with cold water and also to extract important volatile and unstable substances that disappear when heated. Once the cold liquor has been planted and drunk, herbs are poured for the second time with a large cup of cold water, this time with the addition of a big vodka stick. This is because some compounds decompose with alcohol much better than pure water. Again, lengthen for 1 hour and drink the liquor. Pour the mixture with hot water for the third time and drink as normal herbal tea. We use up to one dose of this herbal mixture daily. Although Dr. Duke reported an empirical success with influenza treatment with the above herbal blend, but it is just a cult of personality, not a proper clinical trial. Moreover, the efficiency of the mixture is not absolute (reliability is far below 100%), and the mixture contains slightly poisonous herbs. Therefore, the recipe can only be tested under the supervision of a doctor of medical botany.